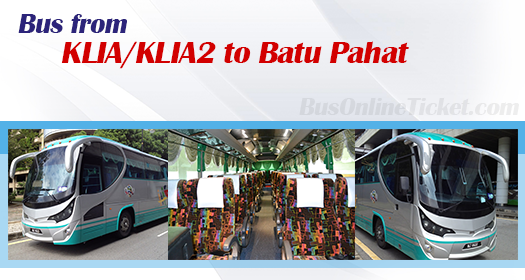 Bus from KLIA to Batu Pahat or bus from KLIA2 to Batu Pahat are the convenient bus service provided by Airport Coach. Many locals from Batu Pahat and nearby towns, as well as foreigner would rather go straight to Batu Pahat after touching down at the KLIA or KLIA2 airport. Passengers taking bus from KLIA/KLIA2 to Batu Pahat can go directly to Batu Pahat without entering busy city Kuala Lumpur, and thus shorten the journey time. Airport Coach is the only operator serving bus from KLIA/KLIA2 to Batu Pahat. The same coach will drop off passengers when passing by Muar. There are total 6 schedules daily for bus from KLIA/KLIA2 to Batu Pahat. After landing and clearing custom, passengers could proceed to coach bay in KLIA and KLIA2 for boarding. The duration for bus from KLIA to Batu Pahat or bus from KLIA2 to Batu Pahat is about 5 hours depending on traffic condition. Coach will depart from KLIA2 then to KLIA, before heading straight to Muar, and then finally terminates at Batu Pahat bus terminal. This direct bus service from KLIA/KLIA2 to Batu Pahat is popular choice to passengers even though they have to pay a premium bus fare for the service from KLIA/KLIA2 to Batu Pahat. The bus fare for bus from KLIA/KLIA2 to Batu Pahat is priced about RM 50.00 to RM 55.00, but it does not stop passengers from taking the bus service. The premium bus fare is justified with the time saving by skipping the travelling time and transit time in Kuala Lumpur. With limited daily trips and sole service provider for bus from KLIA/KLIA2 to Batu Pahat, passenger should always book their ticket online in advance at BusOnlineTicket.com to avoid disappointment or long waiting time at airport. BusOnlineTicket.com provides convenient online booking service and secured online payment options like credit card, internet banking and Paypal payment.